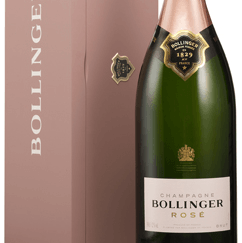 An elegent pink box with the Bollinger Rose Jeroboam 3ltr. Bollinger Rose was created in 2008, the Poirier Saint-Pierre and Montboeuf plots, in Verzenay, are worked in the same style as the Côte aux Enfants plot to complete the production. Because only great wines make great champagnes.